I’ve been in the mood to try new things this week. Earlier in the week I fell in love with painting newspaper with watercolors and now we are using a totally new material to us, tin foil (aka aluminum foil). 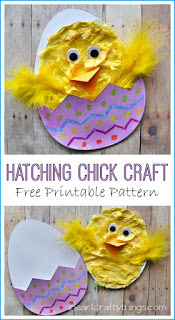 If you are looking for a simple and fun Easter art activity for your kids, this is it! 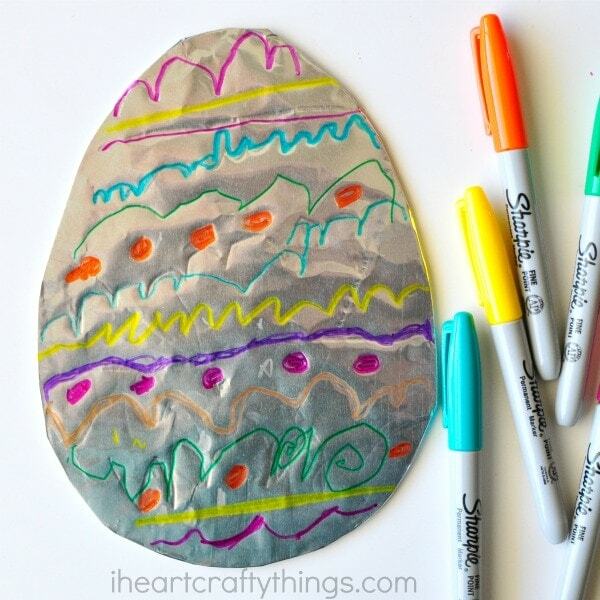 This tin foil Easter egg art is vibrant and colorful and it’s a great opportunity for children to let their creativity shine by creating a unique design on their egg. 1. 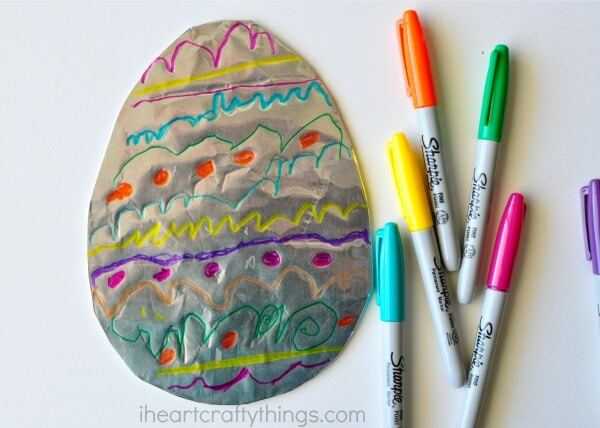 Cut out an egg shape from your cardboard. 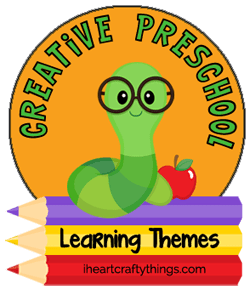 I drew the shape for my preschooler and she cut it out herself. 2. 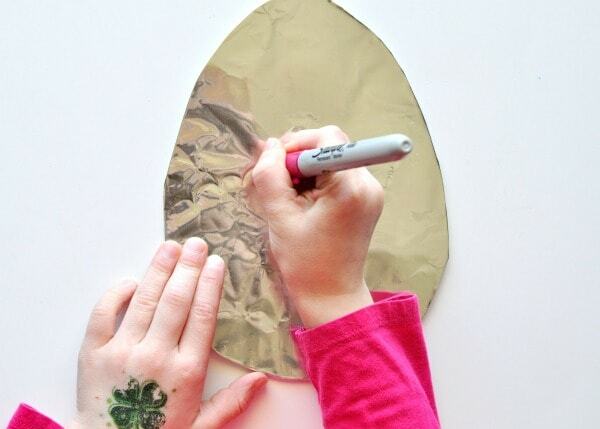 Tear off a piece of tin foil from your roll. 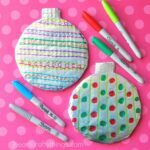 Lay your egg on top of it and then fold the tin foil edges over the egg all over so the front of the egg is completely covered in the foil. 3. 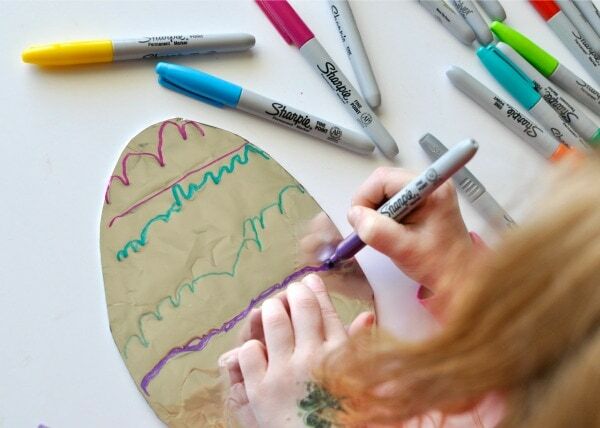 Leaving the lid on the Sharpie marker, have your preschooler use it to draw lines and designs all over the tin foil easter egg. 4. 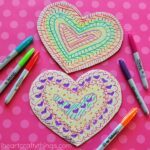 When they are finished drawing designs, they can use all of the Sharpie markers to trace over their designs and add any more details that they’d like. Step 3 isn’t necessary, but I like how it adds some extra texture to the egg. 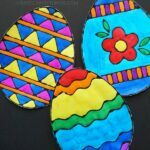 Plus, it’s great for preschoolers to practice hand-eye coordination and general pre-writing skills with the tracing. The Sharpie markers look so bright and vibrant against the shiny tin foil. 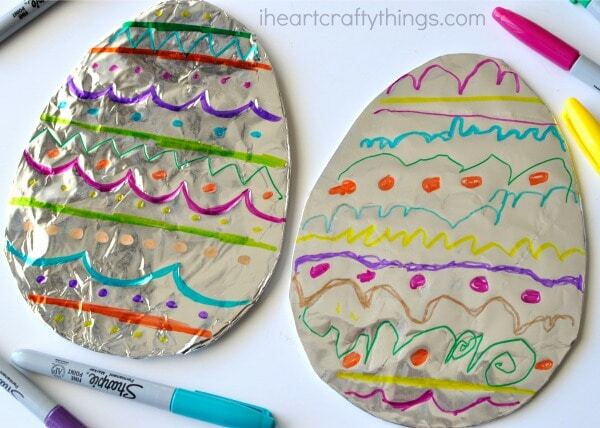 My daughter covered her egg with the dull side of the tin foil but I chose to use the shinier side. As you can see, both worked fantastic so either is just fine. 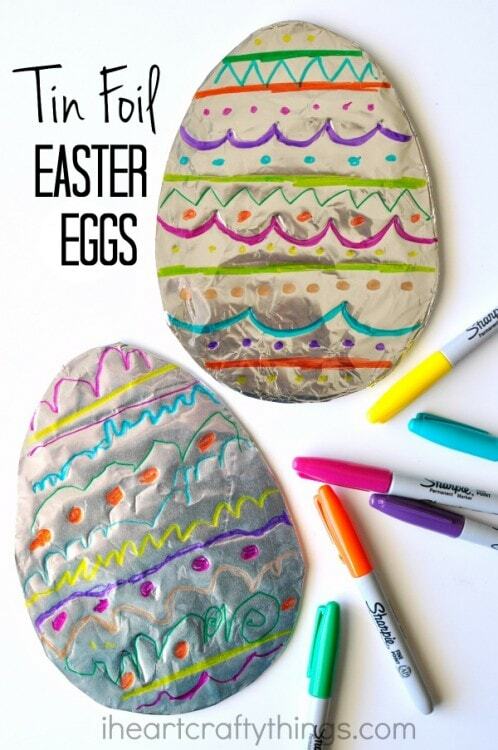 Looking for some fun books to go along with this Tin Foil Easter Egg Art?